Reviews Grunion Gazette > Lifestyle > Musical Notes Chanson du Soir Enchants, Delights By Jim Ruggirello Published: Wednesday, April 29, 2009 1:37 PM PDT Don’t you love the guitar? 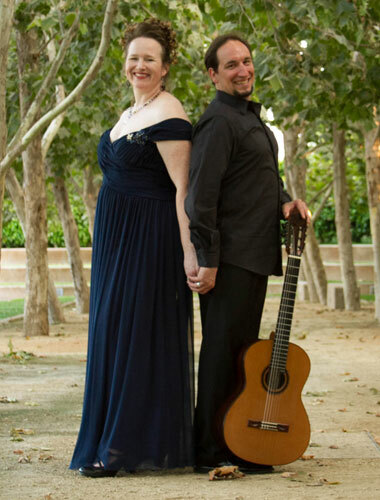 The only thing more pleasing would be the combination of guitar and soprano, and that’s what was featured on the latest offering by the Long Beach Classical Guitar Society the other night at St. Luke’s Episcopal Church. The performers were the ensemble known as Chanson du Soir, consisting of the husband and wife team of David Isaacs and Chelsea Camille. They managed to put together a varied, interesting program of music written for this delightful pairing of voice and instrument, a juxtaposition not often encountered in the concert hall. Isaacs is a wonderful guitarist, sure of technique and in possession of a truly beautiful, colorful sound. He is able to coax out whatever timbre the music demands, and he provided a many-layered cushion of support for Camille’s voice. What a voice it is. The tone is incredibly pure — clear as a bell and remarkably lovely. Her impeccable intonation and a sensitive musicality only add to the listener’s pleasure. 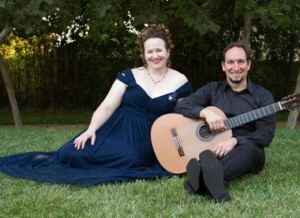 The program opened with a couple of tunes by the Elizabethan composer John Dowland, including the famous “Come Again.” These set the tone the entire evening: tasteful, intimate and enchantingly expressive. Music by Mario Castelnuovo-Tedesco followed, a set from the intriguingly titled “The Divan of Moses Ibn Ezra” along with a couple of Shakespeare songs. Camille introduced each with chatty, informative remarks that had something for everyone, general audience and guitar geeks alike. Three songs arranged by Mauro Giuliani from arias by the now-forgotten Simone Mayr (his opera “Adelaisa ed Aleramo”) ended the first half. Here Camille unveiled her considerable dramatic and comedic chops for a welcome change of pace. Isaacs took the opportunity provided by a couple of solo pieces by Manuel Ponce to display his own range, tonally and expressively. And the jazz- and blues-inflected “Entre Guitarra y Voz” showed both performers in a more popular vein. This is a really cool piece, and it received a really cool performance. 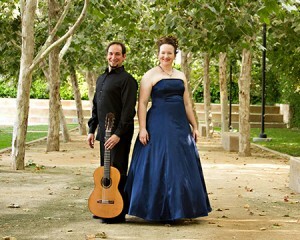 The duo’s performance of Heitor Villa-Lobos’ ubiquitous “Bachianas Brasileiras No. 5” almost made me like this composer’s music, which I usually can’t stand. But the combination of Camille’s bewitching voice and Isaac’s assured accompaniment won me over, at least temporarily. Their reading of the piece was fabulous, just fabulous. Composer Brian Madigan, who was in attendance, wrote the closing set and dedicated it to Chanson du Soir. The three songs, set to texts by three different poets, vary greatly in mood and style; Ralph Waldo Emerson’s “A Fable” ended the evening on a humorous note. I’m sure the performers deserved, and would have appreciated, a larger audience. These concerts by the Long Beach Classical Guitar Society (did you even know there was such a thing?) are just the sort of intimate, high-quality musical event that you can find around town if you look hard enough. You just have to know where to look.